Heat the butter in a large skillet over medium-high heat. Add the onions and sauté until golden-brown, about 4 minutes. Add the sugar as soon as the onions have been coated with butter. Continue cooking until the onions are deep brown and candied, and look browned & crisper from the edges; this can take up to 35-45 minutes. Add an occasional tablespoon of hot water if the pan becomes too dry, or if you see that the onions are sticking to the pan. Season well with salt and pepper to overcome the sugar, and also to help preserve their sheen or gloss. Now you can use them in any recipe that calls for Caramelized Onions. Remember, the trick is in the right amount of sugar, and using medium-low flame, and slowly letting the onions get cooked; patience is the key, so hurrying will not help you get those burnt edges that are so typical for caramelized onions. Note: The more the quantity, the longer it will take to caramelize your onions! Also, the sugar helps to accelerate the browning process, but you can skip it or lower the quantity if using red onions, as they have more water content than their white counterparts. Never tried making caramelized onions 'cos I was under the impression that it takes forever and only Gourmet chefs can make it. Thanks for sharing the recipe, will give it a try. I love caramelized onions...thanks for sharing this. Will now try Carmelize onion, after seeing your post..very nicely explained..thanks for sharing. I didn't knew sugar is also been used...nice info and recipe.. 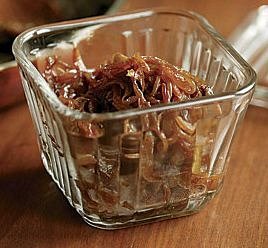 I like caramelized onion nice post and very helpful. Wonderful write and beautifully explained process, it looks like it'll take a couple of trial and errors to get the perfect caramalized onions, thanks for sharing the recipe. I'll try it sometime. The only way to eat onions in my opinion. Great info. This is will be great in a tart! I love caramelized onions - thanks for all the tips! These carmelized onions looks truly succulent. I would love to have some of these. Thanks for the recipe. I an going to try it next weekend. thank you for shearing your post.